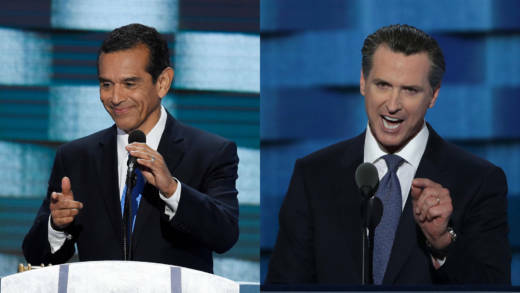 Four months before the June primary election, a new poll finds Democrats Gavin Newsom and Antonio Villaraigosa well ahead of the competition and essentially tied, with Lt. Gov. Newsom ahead 23 percent to former Los Angeles Mayor Villaraigosa's 21 percent. That's within the margin of error for the Public Policy Institute of California (PPIC) poll. Trailing behind the two front-runners were state Treasurer John Chiang with 9 percent, Republicans Travis Allen with 8 percent, John Cox with 7 percent and Democrat Delaine Eastin with 4 percent. Republican Doug Ose was last with 3 percent. The poll found that 24 percent of likely voters are still undecided, including 35 percent of both Republicans and independents or no party preference voters. "The Republican candidates tend to be not well known, even among Republicans," said PPIC President and CEO Mark Baldassare. In fact, more than 60 percent of likely voters have never heard of any of the three Republicans running for governor. More than half say the same about Democrats Chiang and Eastin. The Newsom campaign, citing another poll showing the lieutenant governor with a 15-point lead over Villaraigosa, dismissed PPIC's findings as flawed. PPIC pollster Baldassare shrugged that off, noting that the respected website FiveThirtyEight gave the PPIC polling methodology an "A" grade. "These findings are not that different from our December poll, which showed Newsom ahead of Villaraigosa by 23 to 18 percent," Baldassare said. "They (the Newsom campaign) seemed to be fine with that poll." A December UC Berkeley Institute of Governmental Studies Poll had Newsom leading Villaraigosa by nine points, 26 to 17 percent. Today's PPIC poll also had good news for incumbent Democratic U.S. Sen. Dianne Feinstein. Likely voters prefer her over her challenger, Democratic state Sen. Kevin de León, by a margin of 46 to 17 percent. Thirty-three percent of voters remain undecided in that race. While that suggests an opportunity for de León to improve his standing with voters, he is far behind Feinstein in campaign cash needed to communicate with voters. Feinstein, 84, leads her 51-year-old opponent among all voter categories, including Latinos, who prefer the incumbent Democrat by 47 to 29 percent, and among independents by 41 to 16 percent. Asked which issue they care most about, immigration ranked first with 20 percent, followed by jobs and the economy at 9 percent. Fifty-eight percent of likely voters favor state and local governments making their own policies to protect the legal rights of undocumented immigrants. Eighty-five percent of likely voters, including 58 percent of Republicans, say they support providing legal protections such as the Obama-era policy of Deferred Action for Childhood Arrivals, or DACA, for undocumented immigrants brought to the U.S. illegally as children. Voters also say they are paying attention to the issue of sexual harassment at the California State Legislature, with 46 percent saying they're following it either very or fairly closely. The survey also found that just 32 percent of voters approve of the job President Trump is doing, while 57 percent approve of the job performance of Gov. Jerry Brown. Scott Shafer co-hosts Political Breakdown, a new weekly podcast and radio program on California politics. Subscribe on Apple Podcasts.